Tired, overweight, a little low?….. In addition the ingredients are designed to help you feel invigorated, and better able to cope with the daily challenges associated with dieting. Even the most ideal weight-loss programme (where you combine optimum nutrition with regular exercise) can leave you feeling low. Struggling to get through the day without giving-in to cravings and nagging hunger pangs, can be a serious challenge for even the most dedicated person, determined to control his or her weight. This can make weight loss plans very hard to follow – as a result there is a real temptation to ‘snack’ undoing all the ‘good’ from your diet plan. That is why the herbs in Thermo Complete have been selected to work naturally to help you feel invigorated and better able to cope with the daily challenges of your weight-loss programme – so you can enjoy lasting success! 90 tablets so will last 45 days. What is the maximum number of tablets that I can take daily? Thermo Complete (nutritional vitamin diet supplements) should be used as recommended on the product label. The maximum usage would be 4 tablets daily. Yes. 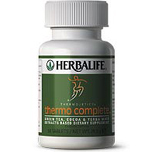 Thermo Complete contains approximately 84mg of caffeine per tablet, roughly equivalent to one cup of coffee or black tea. Thermo Complete combines a potent blend of herbs that have been carefully selected to assist and support the shape-management process. Yerba Mate: – As popular as coffee is in North America, Yerba Maté is the preferred beverage in many Latin American countries. Used by Mexicans to make a stimulating cup of tea to help keep them going, it is enjoyed for that “little lift” it offers! Green Tea : – Well researched and shown to be rich in polyphenol antioxidant nutrients which are reported to neutralise attacks made by free radicals on our body’s cells, green tea helps to keep our bodies strong -essential at any time, especially during a weight management programme. Contains caffeine. Cocoa Extract: – Cocoa extract helps dieters enjoy the reputed mood-improving properties of chocolate without the additional calories. Caffeine: – Thermo Complete combines natural sources of caffeine from four sources, caffeine powder, green tea, Yerbe Maté and cocoa powder. Cinnamon Bark: – Is reputed to help balance blood sugar and therefore may assist in controlling cravings and appetite. Parsley Leaf Powder -Revered by the Greeks as a sacred herb that is reputedly good for circulation while promoting the elimination of waste matter, it is a good source of iron and is also rich in Vitamin C.
Alfalfa Leaf – Also known as Lucerne, contains the powerful antioxidant Vitamin C and a broad spectrum of other vitamins and trace elements that are nutritionally essential. Also has an aquaretic effect. Fennel Seed – Used for centuries as a slimming aid, it’s testimonies date right back to the Greeks. Today research indicates that it also helps promote healthy digestive function. Ascorbic Acid – An easily digested and absorbed form of Vitamin C that is widely considered by many leading scientific research trials to be essential in keeping many parts of our body functioning properly. Licorice Root – Popular with the ancient Egyptians, it may have a healing effect on the intestinal lining and along with fennel seed helps calm the gastrointestinal system.